We have all experienced that heart-stopping moment when our phone slips out of our hands and hits the floor hard. You hear a sickening crunch and instantly wish you had bought a protective case for it. For people who hate to ruin the super slim design and the pretty finish of their iPhones or Galaxy Notes with a bulky, ugly case, DailyObjects brings to you the newly launched ‘ToughCases’- the most stylish protective cases that money can buy. Available in all DailyObjects’ exclusive collections, ToughCases have a 2 piece design. The soft, rubberized inner lining protects the phones from scuffs and scratches and keeps them snugly and perfectly fitted into the outer hard-shell case. The hard-shell case snaps right on to the phone once the soft lining has been put on. The super-light and slim hard-shell case protects a smartphone from bumps and drops. Together, the two parts of the ToughCase, give smartphones 360º protection, on the back, sides and even the screen, thanks to a raised lip that prevents shattered screens even when they are dropped and land face down. 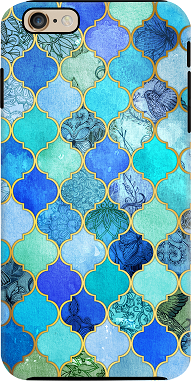 These ToughCases come in over 2200 artistic designs from 39 acclaimed artists from across the globe. Beyond the artwork of these world famous international designers, one can also customize their own case using their own pictures and captions. With a host of easy-to-use templates at dailyobjects.com, one canupload an image, design according to their heart’s content and create a truly one-of-its-kind case, with just a few clicks. The team of experts also offer custom design assistance at no additional cost. All ToughCases come with a one year warranty and the prints on them are guaranteed not to chip, peel or fade. ToughCases offer all the style of the coolest smartphone covers money can buy, with the protection of a hard case, to keep expensive smartphones looking good and staying safe. Tough Cases are available online for iPhone 5/5S, iPhone 6, iPhone 6Plus & Samsung Note 4 at www.dailyobjects.com, starting at prices Rs. 1599 onwards! Overcart Brings You The Redmi Note 4G At Exclusive Price!